Fresh produce growers and packers will have the opportunity to see Greencoat® boxes in action from January 10-13, 2013. Interstate Container will exhibit at the 2013 SE Regional Fruit & Vegetable Conference to promote Greencoat® wax-free boxes for fresh fruit and vegetables at Booth # 228 – 230. 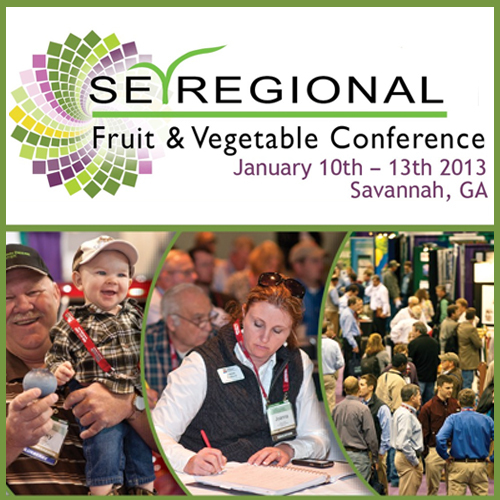 The conference and trade show, taking place at the International Trade & Convention Center in Savannah, GA from January 10-13, 2013, will focus on fresh produce trends and crop production improvements. Interstate Container’s corrugated boxes are used to pack such fresh fruit and vegetables as cabbage, cucumbers, eggplant, peaches, peppers, squash, tomatoes, and yams, in addition to seedlings. Greencoat® boxes are FBA-certified, 100% recyclable and repulpable; they’re also easy to glue and provide the same strength as traditional waxed boxes. Large growers and packers are able to cut landfill disposal fees, ranging from $65 to $125 per ton. The Southeast Regional Fruit and Vegetable Conference is one of the largest educational conferences and trade shows in the southeastern United States that brings together produce growers, vendors and suppliers. The conference houses more than 200 exhibitors and offers a platform to address food safety, commodity sessions on production practices for increased yields, and marketing strategies.